When it comes to the Native American textile market, the classic chief's blankets are the superstars. But early 20th-century Yei rugs are the real sleepers. Yei iconography is related to Navajo religious sandpaintings, which blend the visual with the metaphysical. Navajo religion has a reverence for nature and is based on maintaining a balance in the universe. If your daily rhythm is thrown off-kilter, a lot can go wrong. For instance, if you accidentally kick over an anthill or cross the path of a bear without offering him a prayer of respect, you could upset that sense of harmony and an illness might befall you. Traditionally when that happened, Navajos called in a medicine man. Much like a Western doctor, the medicine man examined the patient and suggested a cure. The remedy involved a combination of chanting, herbal medicines and a sandpainting ritual. A member of the sick person's family would agree upon a fee, which was often paid in sheep, silver jewelry or other forms of barter. Then the healer got to work. He would scoop up various colored sands and sprinkle them on the ground until they formed a specific Yei (holy person), based on the god he was trying to summon. When the sandpainting was completed, it was sanctified by spreading corn pollen over it. The actual ceremony could last for days. Sometimes the patient would be instructed to sit in the center of a series of sandpaintings. The medicine man would wet the palm of his hand, place it on the Yei image, then wipe it on the patient's forehead. If the ceremony was performed correctly, the evil would leave the person's body and the sickness would dissipate. If not, the patient's demise could be blamed on any number of factors. Once the sacred sandpainting had served its purpose, it was erased. To save it or reproduce its imagery was dangerous and could bring serious grief to anyone who retained the image. During the 1890s, the Navajos phased out blanket weaving in favor of rugs. There was strong demand from the vast migration of settlers, building homes by the thousands, who needed something to cover their floors. 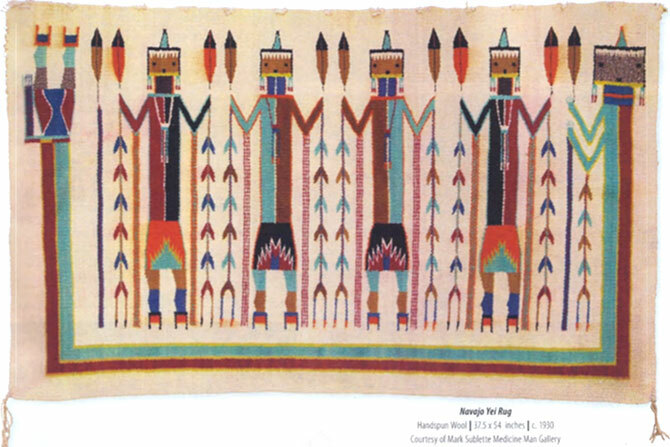 The first Navajo rug depicting holy people appeared during the 1890's. Allegedly, savvy Anglo traders encouraged weavers to incorporate Yei figures into their designs. Tempted by high prices offered for rugs with Yei imagery, a few brave individuals risked the wrath of the gods. When they completed their task and had nothing bad happen to them, the rush to produce Yeis was on. While Yei rugs were technically woven for the floor, they were often placed on couches or hung on the wall like paintings; few actually touched the ground. The most interesting rugs, in that they were quirky, asymmetrical and unique to their creators, were woven between 1900 and 1930. By the 1940s, Yei textile designs had become predictable. To this day, Yei rugs are still being woven, but their imagery has grown less soulful. While some late Yei weavings are quite sophisticated, most hae a sterile machine-made quality that eliminates the element of surprise from each design. There is also a plethora of modern Yeis being woven in Mexico, which should be avoided. Fortunately, they're easy to detect, given their crude weaving and garish color. 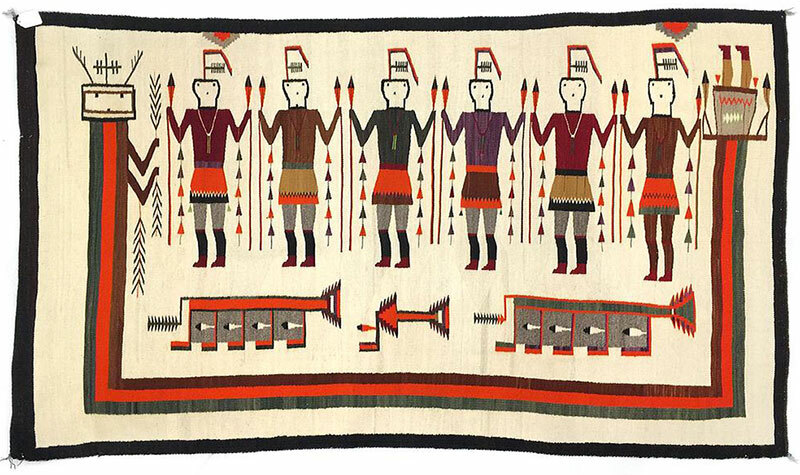 Joshua Baer, a recognized authority on the market for Navajo blankets and rugs, explains, "In 2008, after the housing market collapsed, prices for historic Navajo rugs, including Yei rugs, fell by about 50 percent. Over the last years, prices have recovered a bit, but the market for historic Yeis is still soft." Though large-scale early rugs with single or multiple figures can run up to $25,000, a surprising number of high-quality examples can be bought for under $5,000. According to Baer, the key to acquiring a great Yei rug is being able to find one "that does not look like every other Yei rug." You want an example with soul where you feel the presence of the weaver in the room with you, he says. Another consideration is whether you prefer male figures, distinguished by round masks and short skirts, or female figures depicted with long skirt and square masks. Look for rugs where the imagery lacks symmetry and perfection. Instead, focus on those with quirky, small symbols mixed into the composition, such as birds, sections of rainbows (called rainbow bars), bows, arrows and feathers. 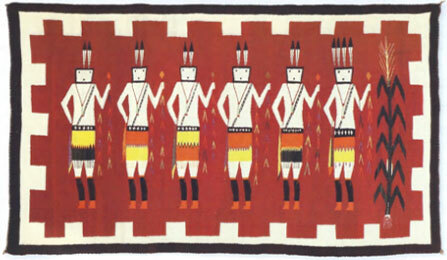 An important factor in determining the value of any Navajo rug is the condition of the textile. Some collectors prefer textiles in their original state with no restoration. The general market consensus favors weavings that have been professionally cleaned and lightly restored. However, it's better to buy a rug in original condition than one that's been improperly cleaned. Aesthetics, value and condition aside, like any work of art it ultimately comes down to finding a Yei that means something to you. Richard Polsky is a private dealer of contemporary and Western art, based in Santa Fe, New Mexico. He's also the author of a number of books on the art world, including I Bought Andy Warhol and his most recent volume, The Art Prophets.